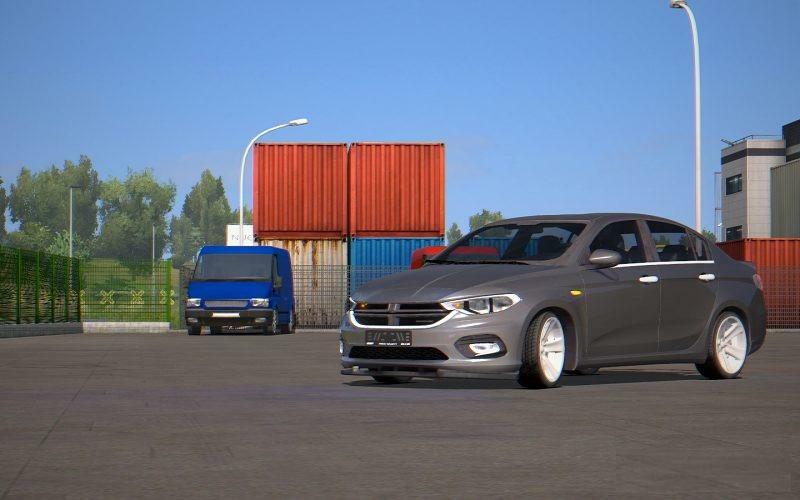 Passenger car Fiat Egea + Interior v2.0 (1.32.x) for ETS2 | Euro Truck Simulator 2 game. The machine was developed in conjunction with Turkish designers. The new model, when compared with the previous one, came out a bit shorter, but added in width. Its unique interior, clean lines, high-styled design, Fiat has not spoiled beautiful sedans and hatchbacks for a long time. The car looks great on the road, inside the cabin still looks good. In the game, the presented Fiat model is made qualitatively, by the way, you will get it in two versions - a sedan and a hatchback; when choosing a chassis, the model will change. High quality textures, maximum drawing and detail. For those who like polichachit on cars from time to time, we suggest you pay attention to this car. The model is new, it is interesting to test it. Buying in the dealership Iveco. Watch the video review of the mod.